Classes are complimentary for our hotel guests and are included with public pool admission. Registered Resort Club & Therapeutic Exercise members receive a club rate. 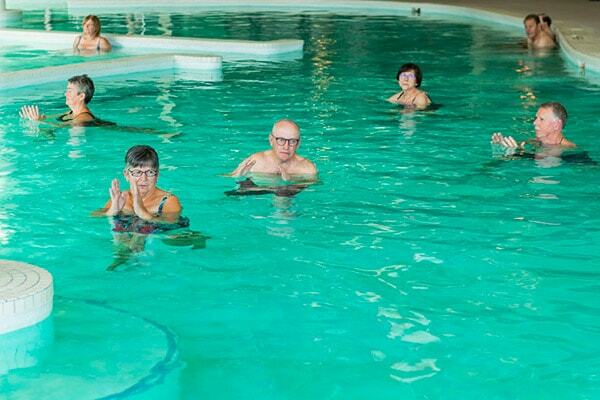 We recommend that anyone suffering from arthritis, chronic muscle and joint pain, or heart conditions, consult a physician prior to participating in the Therapeutic Aquatic Exercise program. For more information, please contact the Sun Tree Spa Reception by email at suntree@templegardens.sk.ca or by phone at 1‑800‑718‑7727 (ext. 6625) or 306‑704‑0111. Enjoy our Therapeutic Aquatic Exercise program in the geothermal mineral pool while you socialize, improve your health, and have fun! Soothing warmth and buoyancy provide the perfect environment for relieving arthritis pain and stiffness, increasing flexibility and range of motion, improving balance and promoting relaxation. Classes have ended and will return in September 2019. Combine water’s unique buoyancy and ease of movement with traditional yoga in our geo-thermal mineral pool. People of all fitness levels can safely enjoy yoga techniques that will enhance flexibility, balance, and strength in body and mind. For your safety, the outdoor pool will close in the event of lightning. Should the pool need to close for any reason beyond our control (ie: lightning), we will provide a rain check for those admitted within the 30 minutes prior to the closure (must have original receipt). Refunds will not be issued. See pool rates. Open year round.